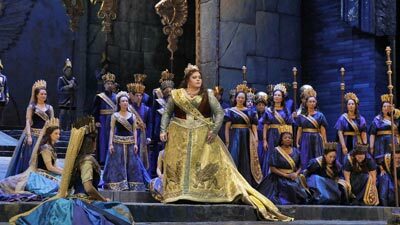 An all-star cast assembled for the Met’s first-ever performances of Rossini’s romantic retelling of Sir Walter Scott’s epic poem The Lady of the Lake. Joyce DiDonato is Elena, the title heroine, who is being pursued by not one, but two tenors—setting off sensational vocal fireworks. Juan Diego Flórez is King James V of Scotland, disguised as the humble Uberto, and John Osborn sings his political enemy, and rival in love, Rodrigo Di Dhu. 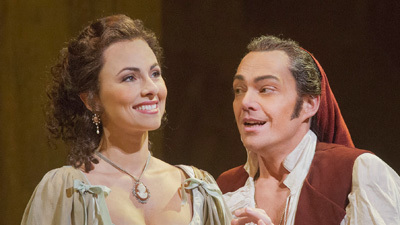 Complicating matters is the fact that Elena herself loves Malcolm, a trouser role sung by mezzo-soprano Daniela Barcellona, and that she is the daughter of Duglas (Oren Gradus), another of the king’s political adversaries. Paul Curran’s atmospheric production is conducted by Michele Mariotti.